Sam-e Supplement 200 mg | Therapeutic Benefits | Get Here! Key role in glutathione cycle, a potent antioxidant produced by the body. ¤ S-adenosyl-methionine (SAM-e) is a naturally-occuring compound in the body which promotes methylation, the process whereby methyl groups (one atom of carbon and 3 of hydrogen) are transferred from one molecule to another. Methylation is essential for many enzymatic processes and SAM-e is the most active of all methyl donors. Indeed, SAM-e has been the subject of dozens of clinical studies involving thousands of patients. > SAM-e supports hepatic synthesis of glutathione, an essential antioxidant. It stimulates the detoxification and regeneration of the liver. It has been used for treating cirrhosis and for helping people to give up alcohol and drugs. 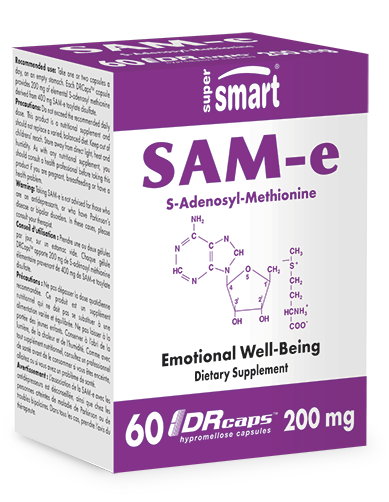 > SAM-e helps treat depression naturally, more effectively and faster than anti-depressants, and without any side-effects. It simultaneously increases levels of several neurotransmitters - deficient in patients being treated for depression. > The methylation promoted by SAM-e is a key element of the energy production process, particularly the recycling of adenosine triphosphate (ATP). SAM-e has a beneficial effect on the mechanisms of ageing by protecting desoxyribonucleic acid (DNA) from demethylation. > SAM-e may also prevent cerebral ageing: in a recent animal study, SAM-e doubled glutathione levels in the brain and increased levels of its enzymatic metabolites by 98%. It decreased a marker of radical activity by 46%, and in culture, reduced lipid peroxidation by 55%. SAM-e is a powerful and pluripotent nutrient which can be life-changing when taken at sufficient levels and in the right form. We introduced SAM-e into Europe in 1998 and while its price has now been reduced by over 70%, it remains an expensive nutrient. > SAM-e is a chiral molecule which exists in two forms: an active isomer (S,S) and an inactive isomer (R, S). All SAM-e products contain these two isomers in varying percentages. The SAM-e that we offer contains 70-80% of the (S,S) form which is the highest level available in a pharmaceutical grade product. Some (too) cheap products contain just 47% or less. > The SAM-e we offer is obtained naturally, by microbiological fermentation and without use of solvents. It is specially packaged to ensure optimal stability and biological activity. Each caspule provides 200 mg of elemental S-Adenosyl Methionine. Take 400 to 800 mg a day on an empty stomach, as required or as advised by your therapist. For preventative use, take 200 to 400 mg a day. Taking SAM-e is not advised for those who are on antidepressants, or who have Parkinson's disease or bipolar disorders. In these cases, please consult your therapist.